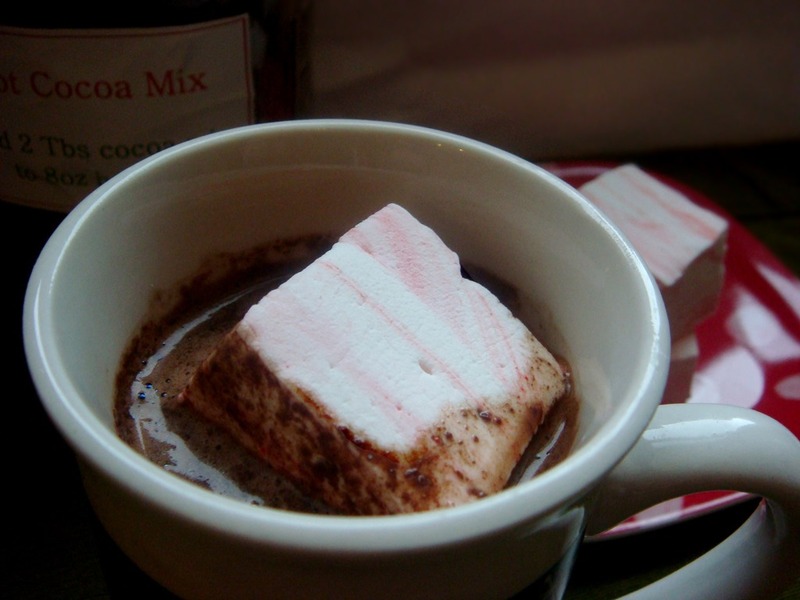 Now that you have Hot Cocoa Mix, it is time to step up your Marshmallow game (I shouldn’t write in the middle of BYU basketball games; sports analogies are not really my thing). But in all seriousness, save the bag of Jet Puff for making Rice Krispies treats, and make yourself (and friends) homemade flavored marshmallows this year. 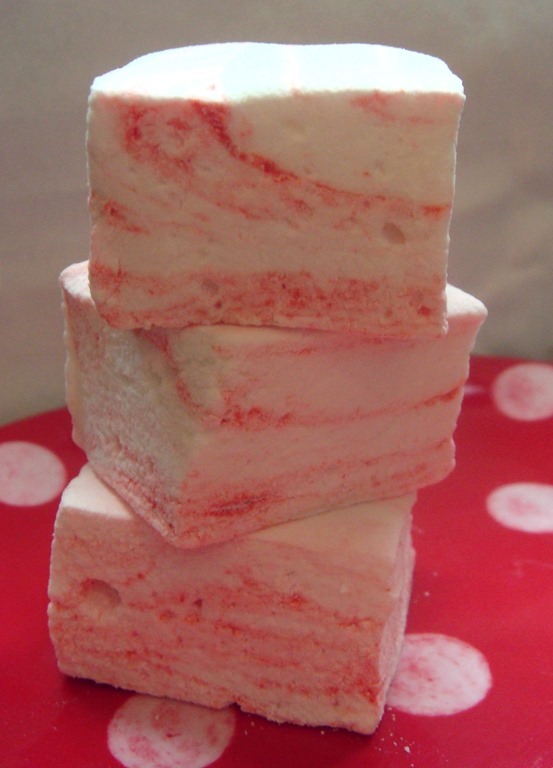 These marshmallows are peppermint flavored with a fun swirl. Marshmallows are a fairly easy candy to make. Much more forgiving than caramels, no tempering like chocolate. In fact, it is the mixer that does most of the work for you. But the powdered sugar coating does tend to make a bit of a mess. You will also need a stand mixer (or a lot of arm strength with your hand mixer) and a candy thermometer. Once the marshmallows have set overnight, you can easily cut them into squares, or use cookie cutters to make fun shapes. Pour 3/4 cup of the cold water into the bowl of a stand mixer. Sprinkle the gelatin over the water. Let stand until the gelatin becomes very firm, about 15 minutes. Sprinkle with salt. In a small saucepan, mix the remaining 3/4 cup water and the corn syrup. Pour the sugar into the center of the saucepan. Bring to a boil over medium-high heat, gently swirling the pan, until the sugar has dissolved completely and the mixture reaches 240°F, about 10-15 minutes. Carefully pour the hot syrup into the center of the mixer bowl with the softened gelatin, avoiding the sides of the bowl as much as possible. Using the whisk attachment, turn mixer onto low speed. Gradually increase the speed to high and whip until the mixture is very thick and stiff, about 7 – 10 minutes, scraping down the bowl as needed. Add the vanilla and peppermint extract and mix until well blended. Turn off mixer and place 2 –3 drops of red food coloring on top of the whipped mixture (space drops evenly throughout the bowl). Pulse 2 or 3 times until gently swirled. Do not overmix, or you will just have pink marshmallows. Working quickly, scrape the mixture into the oiled pan using an oiled spatula. Smooth the top into an even layer. Sift 2 Tbs of the powdered sugar mixture over the pan. Cover and let sit overnight at room temperature. Place the remaining powdered sugar mixture in a large Ziploc bag. Working with 3 or 4 marshmallows at a time, toss the marshmallows in the bag with the powdered sugar mixture, then toss in a fine-mesh strainer to remove any excess powder. Marshmallows can be stored in an airtight container or bag for up to 2 weeks. I would have never thought of doing this…thanks for sharing. I’ve always wanted to try making marshmellows but have never had the guts to do it! They were definitely not as intimidating as I thought they would be.